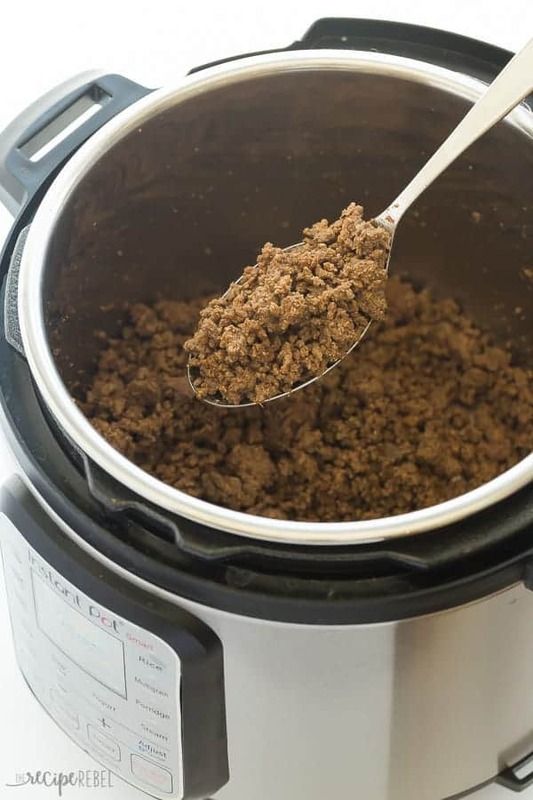 This Instant Pot Taco Meat from Frozen Ground Beef is the easiest way to do weeknight dinner! No thawing the meat, no extra pots — just throw it in the Instant Pot or pressure cooker, cook and season! This taco filling is perfect for tacos, burritos, quesadillas, or taco salad and great for prepping ahead! Happy Thursday friends! I’m jumping in here for yet another Instant Pot recipe, and we’re still sticking with the basics: how to make Instant Pot taco meat from frozen ground beef! 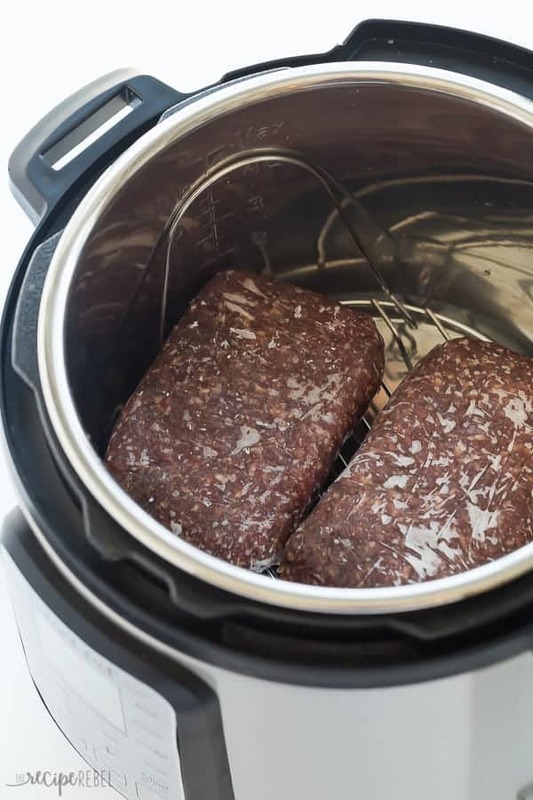 I’ll admit, when I first heard about people cooking frozen ground beef in their Instant Pots, I wasn’t convinced. I mean, how can that even work? Wouldn’t it cook into a big solid block?? But after my success with cooking frozen chicken breasts in the Instant Pot, I was pretty determined to give it a try! Friends, I have a 3 month old, a 3 year old, and a 5 year old. I’ve got a lot on my mind, and I’ll be honest, spending a lot of time running around like crazy not really getting anywhere. If I actually remember to take some meat out to thaw in the morning, it’s some kind of miracle. If the 3 month old makes it into real clothes for the day, it’s also some kind of miracle. So learning to cook meat from frozen is one of the first things I knew I had to do with my Instant Pot! It’s a game changer you guys. I usually cook two pounds at once, and they are frozen into square blocks. They are pretty thick, so even if your meat is in a slightly different shape it shouldn’t take any longer. If you have more than one pound frozen together, you will want to add 5 minutes or just cook longer on saute at the end. Because I am going to saute it with the seasoning in the end anyway, I’m not that concerned about it being completely cooked through after pressure cooking. I would rather have it a little easier to crumble and a little pink yet in the inside, then totally dried out and tough. 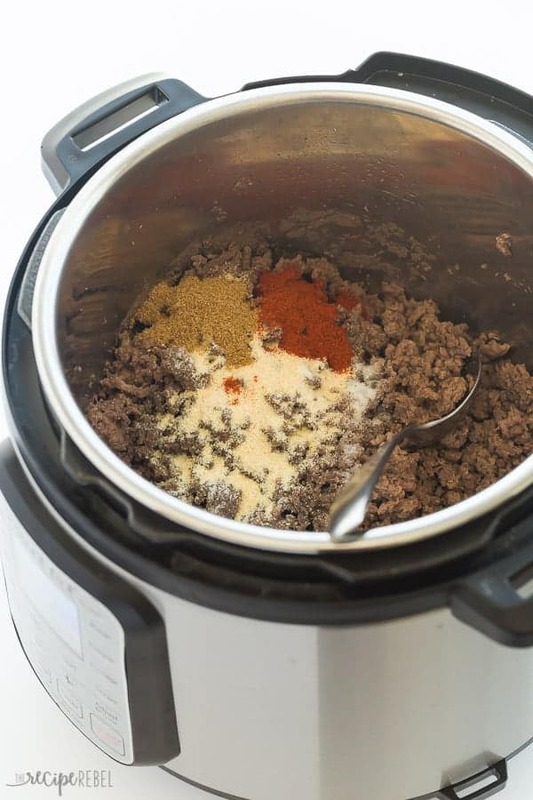 This Instant Pot Taco Meat from Frozen Ground Beef is the easiest way to do weeknight dinner! No thawing the meat, no extra pots -- just throw it in the Instant Pot or pressure cooker, cook and season! This taco filling is perfect for tacos, burritos, quesadillas, or taco salad and great for prepping ahead! Pour the water into your Instant Pot (mine is a 6 quart) and add the trivet or a cooking rack. Add the ground beef, side by side, on top of the trivet. Set the Instant Pot to Manual, high pressure, for 18-20 minutes (18 if your blocks are thinner, 20 for thicker blocks in the middle). At the end of the cook time, turn the Instant Pot off. Do a quick release and drain the water from the Instant Pot (I like to use my trivet to hold the meat in the pot as I dump out the water). Using a strong metal or wooden spoon, crumble the ground beef. This will take a few minutes! It's okay if your beef isn't cooked right through as we're going to be cooking further. Turn the Instant Pot to saute and add the 1/2 cup water, cumin, garlic, paprika, salt, onion powder, black pepper and cayenne and stir until thoroughly combined, adding an additional 1/4 cup water if necessary. Serve immediately, refrigerate for up to 3 days, or freeze for up to 3 months. This recipe will work just as well with fresh ground beef! Set the Instant Pot to Manual, high pressure, for 15 minutes and then crumble on saute as per the recipe. Can you do this with only 1 lb of ground beef? If so, how would the recipe/method change? Also- I’m brand new to InstantPot- is there a good technique for draining out the water? With fresh ground meat do I just put it in the pot or do I still use the trivet and water? If you’re using fresh ground beef you can just saute and completely skip any pressure cooking! Great recipe! Used tonight when I forgot to thaw out the ground beef and it turned out terrific! Thanks so much for posting. I’m so happy to hear that! Thanks Tod! I put 2 pounds of frozen meat in the pot for 20 minutes. It was mostly cooked, but I could still break it up easily. It didn’t take long at all to break up and it had finished cooking by then. I drained the water, added the spices and fresh water. It was so easy! Thank you! I will definately do this again. Thanks Karen! I’m so glad it worked out well for you! How do you reheat this after you freeze it.? You can thaw in the fridge and microwave or reheat it on the stove top pretty easily. How long do you sauté for. Until the meat is cooked and has absorbed the spices. Probably about 4-5 minutes. I love the concept, but I think you’re overcooking the meat a bit, especially since it’s going to need to be sauteed with the spices. I also like to add some onions, fresh garlic, and bell pepper. I’m going to try it with 10 minutes and see what happens. You can definitely adjust as you like 🙂 I like it to be thawed enough in the middle that I can easily break it apart! Thank you for this post! My instant pot just arrived so I was eager to try it out. Tacos were on the menu so I decided to give this recipe a try. Worked like a charm. I was nervous at first because my ground turkey blocks were too big to lie side by side so I had to stack them. After the 20 minutes of cooking, I opened the pot and where they were touching was still pretty pink. But like you mentioned, I switched to sauté and it finished cooking while breaking the turkey into crumbles. I ended up pulling some out before adding the seasoning for a future meal. So happy with the results! I don’t have the rack, is it possible/ok to do this without the rack? I don’t think it’s a good idea to place the frozen ground beef right on the bottom of the pot. Maybe you have something you can put it in or on to keep it off the bottom? A steamer basket works well if you don’t have the Instant Pot rack. Do you put the trevit under or over the meat while cooking? You just follow the recipe as written. If you put the trivet UNDER the meat to cook it, how do you use the trivet to keep the meat in the bowl while you’re dumping ova eh water? Another great way to use my Instant Pot! And I NEVER remember to take ground beef out to thaw. It’s like some kind of mental block, I had no idea you could use an Instant Pot (never considered it). Love that I came across this! Yes! So hard to remember!